them back to you whenever you need them. We'll bring our clean plastic bins right to your door for your convenience. Pack your items into the bins. Our driver will take an overhead photo of them for you to inventory once they are in our system. When you are ready we will pick-up the bins and store them in our own secure, climate controlled warehouse. 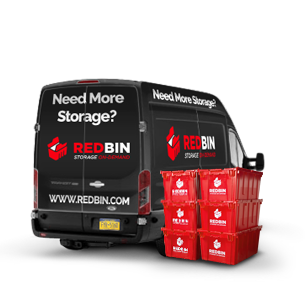 RedBin has changed the game when it comes to self-storage. Gone are the days of renting a storage unit and lugging things back and forth. We are the best at what we do! Unlike our competitors, our warehouse is really secure. Why? Because it's our own warehouse. We do not rent space from a third-party. Our Location and your belongings at any time. We are located in the Liberty View Industrial Plaza. 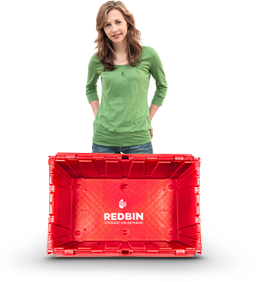 Everything about RedBin is convenient. We will bring our bins directly to your door, and pick them up. Specify different locations for drop-off and pick-up, if that's what works for you. Scheduling is flexible as well. All we need is a day. Next day drop-off, pick-up or re-delivery is always available. Order & Check Storage from Anywhere! Once your overhead photos are loaded into your account you will be able to itemize your inventory. 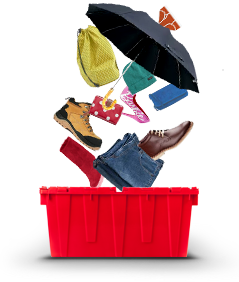 In addition you will be able to request delivery of a bin or individual item back to you. Ready to Get Started? Get your Storage for $7.00 per Month! © 2019 RedBin | All Rights Reserved.